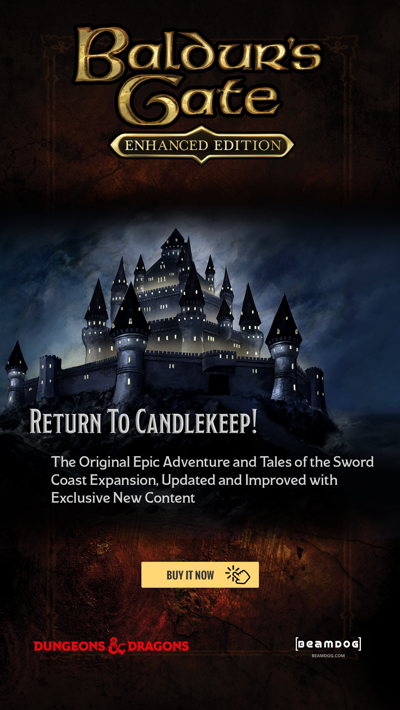 The new Neverwinter Nights: Enhanced Edition main menu art from the Google Play Beta will come to the PC version of NWN:EE. During today’s livestream Beamdog CEO Trent Oster and Producer Luke Rideout shared the latest Neverwinter Nights: Enhanced Edition and Infinity Engine news. They discussed the latest patch to the NWN:EE Android Beta, answered community questions, and provided an update on the upcoming 2.6 patch for Baldur’s Gate: Enhanced Edition, Baldur’s Gate II: Enhanced Edition, Baldur’s Gate: Siege of Dragonspear, and Icewind Dale: Enhanced Edition. Baldur’s Gate II: Enhanced Edition and Baldur’s Gate II: Enhanced Edition Official Soundtrack are 40% off on Beamdog.com! The sale ends Sunday. 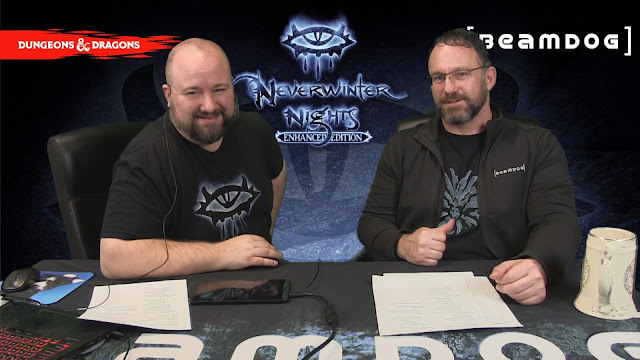 Yesterday a new patch was released for the Android Beta of Neverwinter Nights: Enhanced Edition. This brings the Kingmaker, ShadowGuard and Witch’s Wake Premium Modules to your Android device, and also introduces long-awaited achievements for NWN:EE! These achievements will come to Steam in the future. We’re currently testing them via the Google Play Beta. The current Beta build is a release candidate for the live version of Neverwinter Nights: Enhanced Edition on Android, so play it, test it, and share your feedback via our Service Desk and on the forums! Baldur’s Gate turns 20 years old next month! Watch out on our Facebook, Twitter, newsletter, and forums for more news on a special contest to celebrate this remarkable anniversary! We’re still hiring! If you’re a Programmer, Technical Artist, or Web Developer, check out our career page and apply! 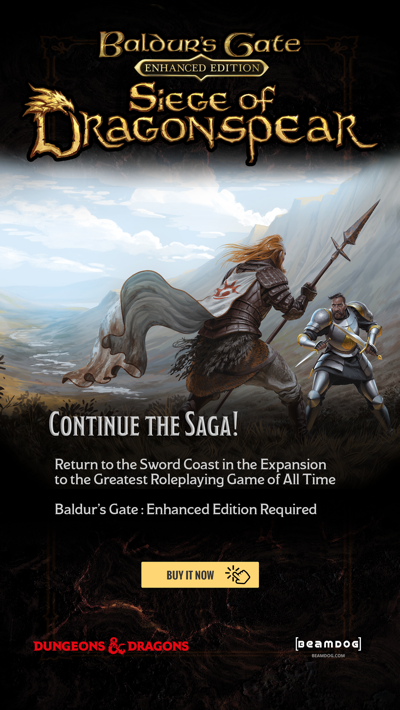 We’re waiting for approval on the 2.6 patch for Baldur’s Gate: Enhanced Edition, Baldur’s Gate II: Enhanced Edition, Baldur’s Gate: Siege of Dragonspear, and Icewind Dale: Enhanced Edition. The portrait highlighting feature (i.e. when you pick a better item for a character, his or her icon is highlighted in yellow) from Baldur’s Gate: Enhanced Edition, Baldur’s Gate II: Enhanced Edition and Baldur’s Gate: Siege of Dragonspear will be ported to Icewind Dale: Enhanced Edition as part of the 2.6 patch. We’ll look into Spanish VO for the original Baldur’s Gate and Baldur’s Gate II. If we can track down the appropriate source files, we’ll try to re-introduce it in the Enhanced Editions. We’ve made some performance improvements and optimizations as a part of the new patch to the Neverwinter Nights: Enhanced Edition Android Beta. If you’re still experiencing performance issues on your Android device while playing the Beta, try going into the Graphics options and turning off pre-buffer effects. There seems to be an issue with multiplayer CD-Keys Neverwinter Nights: Enhanced Edition on Android where some players were assigned the same key. If you’re running into this issue, find instructions on how to fix the issue here. The iOS version of Neverwinter Nights: Enhanced Edition is planned, but it’s going to take a while. 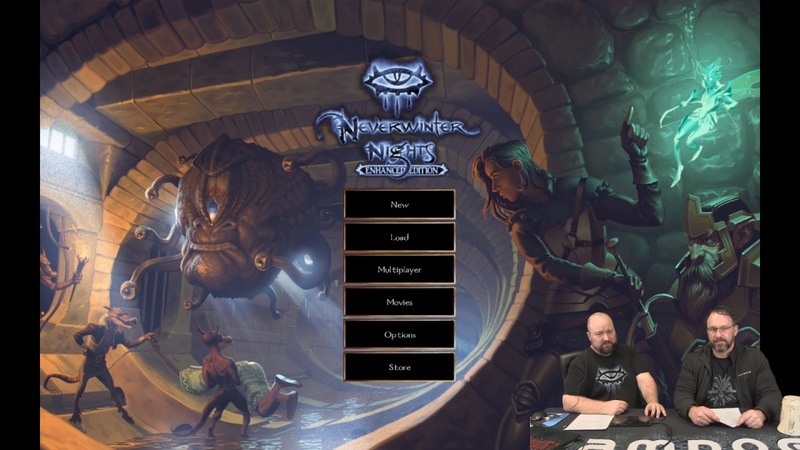 The new main menu art which you can see in the Android Beta of Neverwinter Nights: Enhanced Edition is created by Beamdog artist, Tom Rhodes. Find more of his work here. Neverwinter Nights: Enhanced Edition doesn’t have official controller support. Let us know about your feature requests on our forum. We’re planning on getting True Type Fonts support, as well as some other features like keyholing and fine UI scaling, ported to the desktop version of Neverwinter Nights: Enhanced Edition soon. Updating weapons’ and shields’ models for Neverwinter Nights: Enhanced Edition is an ongoing project. The plan is to work our way through and make improved versions of most content in the game. 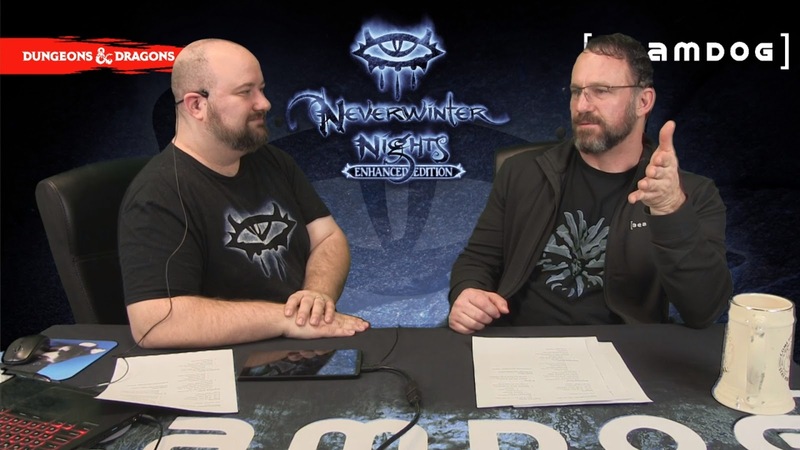 According to Trent, the new renderer for Neverwinter Nights: Enhanced Edition is still “kinda research-y”, we’re still working on it. Cam is working with Niv and Soren to make sure we don’t break custom content in the process. Our goal with the renderer update is to take the existing content and make it better. UI improvements for Neverwinter Nights: Enhanced Edition will be a part of the renderer rewrite. Excited for what’s next? Come and join the next livestream next week!